The same can be said of a voltmeter  owning a voltmeter doesnt qualify a person as an electrician. Most maintenance peoples hydraulic diagnostic skills are acquired through trial and error. Even the companies who design and manufacture flow meters dont fully understand how and where to use their products to test hydraulic components safely and effectively. 2. Basic hydraulic laws and principles. 3. How to test hydraulic systems and components. Hydraulic systems present a wide variety of unique safety hazards. An awareness of these safety hazards can only be garnered through training that focuses on all aspects of hydraulic safety. Every element of hydraulic components and system function is, in one way or another, tethered to a basic hydraulic principle or law. These principles and laws CANNOT be learned through on-the-job training - or more appropriately, through trial-and-error. Once a person has a thorough understanding of hydraulic safety; principles and laws that govern hydraulics; the purpose of the primary components in a hydraulic system; and finally, the theory-of-operation of hydraulic components, he/she is ready to advance to learning and understanding diagnostics. However, knowing the purpose and theory-of-operation of hydraulic components is not enough to make an informed analysis of a component's condition. To be an effective diagnostic technician a person must learn exactly how much hydraulic components leak by design. After all, testing hydraulic components is, for the most part, the task of analyzing component leakage rates to determine if they are good, marginal, or unacceptable. Ironically, while the health of hydraulic components is determined by analyzing leakage rates, there is little or no comparative data available to support a technicians findings. In fact, while the industry marches out of step with safety, it appears to march in-step with component testing. For example, the entire industry embraces the case flow test for hydraulic pumps and motors. Yet, the so-called case flow test has a 95% margin of error. This proves that the vast majority of so-called test procedures floating around the industry are plagiarized - it is blatantly apparent that no-one has paused to question the merits of the many component test procedures. A mechanic, with no formal training in hydraulics, was asked by his supervisor to determine why the bucket on the companys front-end loader was drifting down. Although he had never personally used a flow meter, he had, during the course of his career, seen a person use one to test a pump. He found an inline flow meter lying on a shelf so he cleaned it off and installed the adaptors he needed to install the flow meter in the transmission line at the most accessible point  the rod-end of the cylinder (Figure 1). He had no idea (only the part number reflected the fact) that the flow meter was designed to permit flow in one direction only. 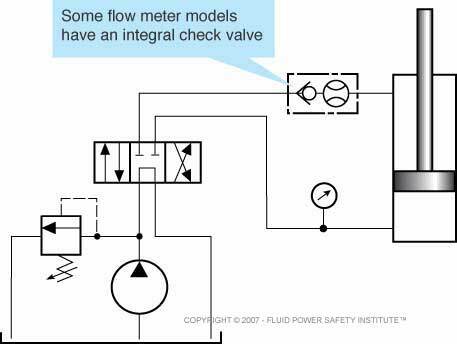 NOTE: Flow meter manufacturers (in-line type) generally do a poor job of indicating whether a flow meter is a uni-directional type or a bi-directional type. Once he had installed the flow meter, he asked the operator to start the machine and cycle the cylinder as he observed the flow meter. There was a thunderous explosion as the flow meter burst. Oil discharged from the gaping hole at extreme velocity and pummeled his body. It blew his hard-hat and safety glasses off and filled his eye sockets with hydraulic oil. The operator shut the machine down and rushed to his aid. The mechanic was fortunate in that he did not (this time) suffer a lost time injury. His supervisor, who was as equally ignorant about hydraulic as the mechanic, wrote the failure off as a "defective flow meter." A formal investigation to determine the root cause of the failure was never conducted. In addition a near-miss report was not written about the incident. There is no doubt that training would have prevented this accident. A course in basic hydraulics would have taught the mechanic about force, pressure, and area as it applies to a hydraulic cylinder. He would have learned that a double-acting, single rod hydraulic cylinder is, in addition to being a device which converts fluid energy into linear mechanical energy, a pressure and flow intensifier  (Figure 2). Also, he would have learned about the different flow meter designs, and how to properly and safely use them. Let's say that the cylinder's rod-to-bore ratio is 2:1 - meaning that the major area of the cylinder piston is 10 square inches and the rod area is 5 square inches. 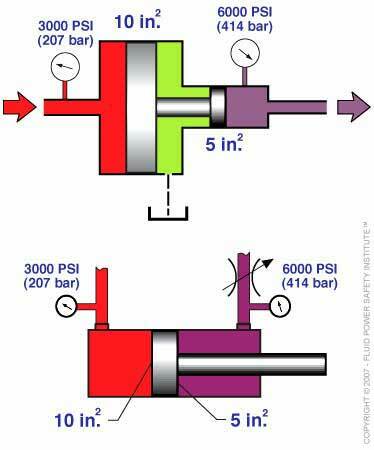 The system's pressure relief valve setting is 3000 PSI (207 bar). In a basic hydraulics course a person learns that FORCE = PRESSURE x AREA. Therefore, 3,000 lbs (PRESSURE) x 10 square inches (AREA) = 30,000 pounds of FORCE. In that same basic hydraulics course, Pascal's Law tells us that PRESSURE = FORCE ÷ AREA. If the force is 30,000 lbs. and the area is 5 square inches, then the pressure is 6,000 PSI (414 bar). The pressure rating of the flow meter was 3000 PSI (207 bar). The type of flow meter the victim used had an internal check which allowed flow in one direction only. When the operator was instructed to cycle the cylinder  retract and extend the rod  the check valve blocked the flow causing the pressure to intensify well beyond the maximum safe operating limits of the flow meter. 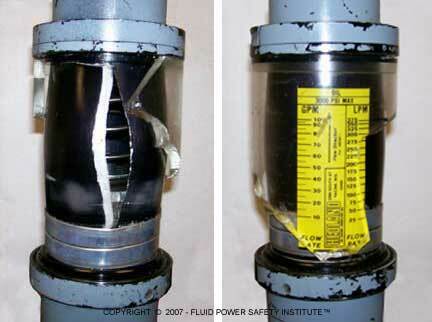 The photographs (Figure 3) shows how the excessive pressure literally blew a gaping hole in the side of the weakest part of the system  the flow meter. Over 98% of Americas maintenance workforce is not properly trained in basic hydraulics let alone system and component diagnostics. If you are not trained in hydraulics DO NOT work on hydraulic systems  you could get severely injured or killed. The victim in this alert was lucky  you might not be! If you want to learn how to work safely with hydraulics and how to be a very effective diagnostics technician, attend a workshop presented by the Fluid Power Training Institute.